This week’s Open Field Acoustic Campfire features local band Cruel Haiku. Come gather round the Open Field Plaza around 8 pm for some twangy tunes and wind down your Target Free Thursday Night. What is a “Cruel Haiku” you may ask? 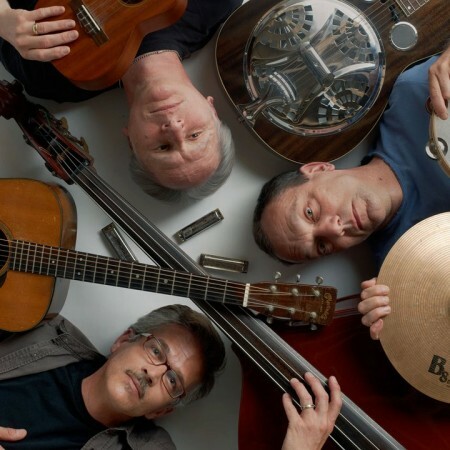 Simply, the combined twisted originals and head-scratching interpretations of once-sacred classic songs by Gary Krainak (vocals, guitar, harmonica, ukulele), Steve Michels-Boyce (vocals, bass) and Paul Shambroom (vocals, guitar, Dobro, percussion). The seed of Cruel Haiku was planted around a campfire 25 years ago and has finally poked its head above ground. Krainak returns to the local stage after a brief 30 year hiatus, having once played in the bluegrass band Minnegrassco. Shambroom is an internationally recognized photographer and inventor. Michels-Boyce, by far the best looking of the group, is a long-time fixture of the local Twin Cities scene, and currently also plays with The Melvilles.